You can go bare footed or bare skinned if you want to, but, I want you to show a little bare ground for the bees! Seriously, our native ground nesting bees nest in bare soil; so, show some soil! leaves over bare ground are fine, too. It's possible that a heavy mulch may discourage bees from tunneling in your garden. Especially, mining bees. They are super important critters for spring and early summer pollination; critters you don't want to discourage. Green Metallic Sweat Bees are ground nesters, too. I'm not saying don't mulch! Mulch is good. Just remember that, too much of a good thing means no bare ground for our friends the ground nesting bees. Find a sunny area in your garden that you can leave mulch free or, if bare ground is too exposed, add a light layer of leaf mulch. 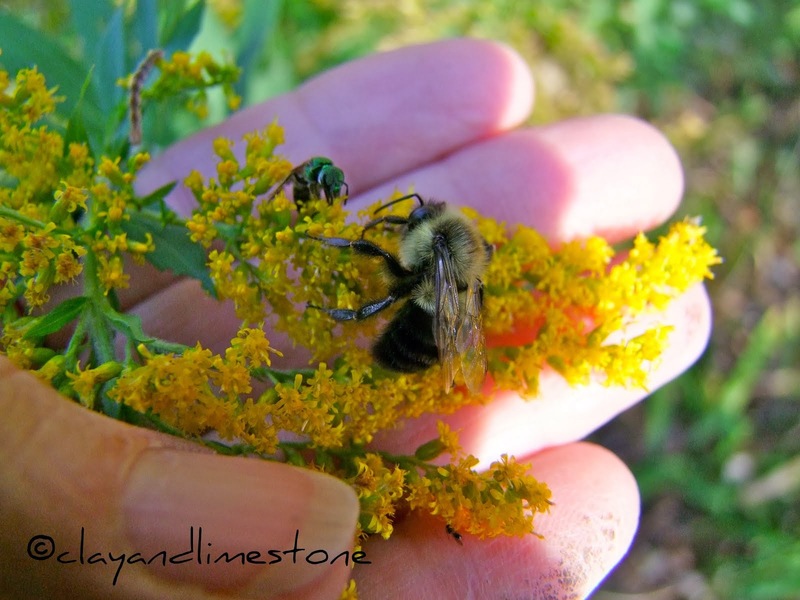 Trust me~You want these bees in your garden! Mining bees are more efficient than honeybees for the amount of pollination they deliver per bee. Add to that the decline in honeybees due to Colony Collapse Disorder and miner bees become even more important to our gardens and agriculture. There are just over 1,400 hundred species of Mining bees in North America. Mining bees (or Andrenid bees) resemble the typical honeybee in shape and size. Bodies are colored dark with fine light brown or yellow hairs. Mining bees are solitary bees and do not live in socially organized nests. Like the Green Metallic bee and other sweat bees, mining bees nest underground and frequently choose to live in a 'neighborhood' of other ground nesters. If you see one bee tunnel, you may see several. I mulch! Here in the Middle South we are fortunate to have plenty of pine straw and that's what I use on the paths throughout C and L. But, all the beds are mulched with leaves. It's good for bees and other critters. ...and one more thing~Ixnay on the plastic or fabric weed barriers. It's not good for anything! PS I trust you already know that pesticide is a No-No! Such pretty pictures of your garden! Great info on the mining bees too. Weed fabric, very bad. What a great post! I've seen mining bees around the property, but never thought of giving them a bit of their own real estate. I don't use much mulch, anyway. The chickens get it into it and go nuts. The mulch gets tossed everywhere! What a wonderful post Gail - so much information and sublime pictures. Great and interesting post Gail. I did not know of the way these bees tunnel their solitary nests. I am amazed at how root like their tunneling is! If this drawing is true to life. Truly fascinating. Your garden looks so lovely too! Thank you for thumbs down on that awful plastic lining. Happy Valentine's Day Dear Gail!! Great post Gail. I go bear too and I'm proud of it! H.Happy Valentines. Once again, I've learned something new about bees! Thanks for this helpful information, Gail. I have to use some mulch because I'm always doing battle with a weedy grass, but there's no more landscape fabric or plastic here. I learned the hard way what a nuisance that stuff can be. A really good point, Gail -- it's one I only learned bee-latedly. You're smart to cross reference articles, too. Wow. Now that is an incredibly interesting and educational post! Not to mention absolutely awesome photos. Thank you! I don't know whether I have this kind of bee, but in spite of my best attempts, I always have bare soil in both the veggie garden and the perennials beds. I'm glad this is a good thing after all. Great post Gail. Not sure what the equivalent is in the UK, but I'm sure there is one, and am happy to learn more about what to do to make them welcome. Good advice, Gail! I heard somewhere that the giant bumblebees I adore also next in the ground, but I haven't researched to be sure. I can't wait to hear the cheerful buzzing in a few months. 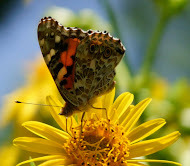 I have plenty of bare soil...the butterflies like to puddle...lol..very educational post Gail. Hot damn, I'm delighted to know I'm doing a good thing by not mulching every square inch of bed. I hope the mining bees will take advantage of the welcome non-mat! It's so good to know that my practice of using shredded leaves as mulch benefits the bees. Such beautiful images in this interesting post. I had no idea that mulching every bit of a garden bed would discourage bees. Hi Gail, what an interesting post. Outside of the bumble bees that often nest in holes, I didn't know much about other ground nesting bees. Good advice Gail! Our bees can use all the help they can get. I love when I'm able to discourage clients from landscape fabric and plastic - it's horrible stuff, and doesn't even work to keep weeds from sprouting. In the case of landscape fabric, all it does is make the weeds harder to pull. Love those bees Gail. They can tunnel around here in several places. We like to watch them come and go with their prey and pollen. Happy Valentines Day. It is nice that you are spreading the love for bees today. I'm thinking I may have seen some bees near the ground before. Maybe it was these. I know we have a variety of bees around here. I enjoyed your post and photos. I need to check out your other bee posts. Beautiful pictures! In your picture with the pinestraw path, there are some purple flowers in front of an iris. Are they irises also? They are beatiful. I am not familiar with them. Would love them in my NC garden. After reading about these Miner Bees I feel better about all the mud we have this time of year. Thanks for sharing! Great post Gail. I learned something I didn't know. I only mulch lightly in flower gardens to help keep weeds down. I did not know about Miner bees, especially the mulching. That was surprising, yet it really made a lot of sense. Gail, your posts are always so well thought out and full of information. This was very interesting to read. I never mulch my flower beds so maybe I have some of these bees and haven't noticed? I sure hope so. You are right about helping them any way we can. Promise, I will bare myself for the bees and, in fact do! Your first photo is especially grand, Gail! For you and the bees, heartfelt wishes for a happy spring. Fabulous post, from my bee loving friend. I could not agree more Gail. Ixnay, eh? Okey dokey. We have bare soil in lots of places and leaves in the beds. Always an interesting post on bees. You are a font of info — all of it new to me. I do have bare soil, so now I won't rush to cover it up. You've saved me a chore and maybe made some bees happy. Hi Gail, Was wondering around outside & found peach tree & blueberries in bloom. A baby bumble was buzzing around blueberry. He looked so cute. I love to watch all the little critters. I had someone come in to the store last year wanting to kill these, to which I said "why would you want to?" To which he said "because they are bees." I had no idea that some bees tunneled. I just discovered for the first time this past summer that they lived on the ground at all when we discovered there was a nest underneath our shed. I had always assumed they had nests hanging from trees like wasps. Thanks for providing such great information. Hi Gail, I'm not sure where our pollinator bees are burrowing but the only in-ground nests we seem to get are the mean spirited yellow jackets. I know, I know, they have a purpose too. I just wish they were nicer to humans. Great post! Great information that I never knew. And such a lovely presentation. So glad I came today! Great post Gail - bee bare! I heard about ground nesting bees from a friend who has them in her front lawn. Never seen any nesting here but will be on the look out.